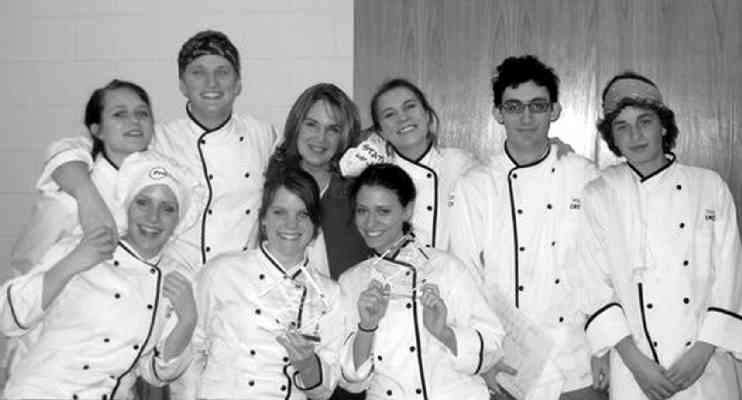 Members of the Durango High School culinary teams pose at Mesa State College in Grand Junction on Feb. 13. They are: front row, from left, Kerri Horvath, Paige Krull and Nora Schweitz; back row, from left, Bailey Younger, Alex Schweitz, Susie Francis, Lexy Andrews, Will McLaughlin and Alex Max. Not pictured: Alberto Cruz (team alternate). A Durango High School culinary team is preparing for a state tournament after winning first place at a regional competition earlier this month.The team took the top spot at the ProStart Regional Culinary Competition at Mesa State College in Grand Junction on Feb. 13, sending the students on to the state tournament at the Grand Hyatt Denver will be on March 17. To win the regional tournament, the team created an appetizer of Japanese sushi shots and an entrée of sumac berry and crusted salmon with citrus sauce, braised fennel and couscous. For dessert, the team prepared poached pear in port wine with a lemon zabaglione sauce topped with mango rum caviar. The teams were judged on the food's taste, teamwork, sanitation and other factors. To prepare for the state tournament, the students are reviewing the judge's comments from Grand Junction. Local chefs from many of the prominent restaurants in Durango are critiquing the students' work. The students also are doing dry runs to prepare for the tournament's time pressure. "They have one hour to make a gourmet meal using only two burners," said Susie Francis, who teaches the DHS classes that act as feeders to the ProStart competition teams. Alexa Andrews, Alex Max, Will McLaughlin, Alex Schweitz and alternate Alberto Cruz comprised the first place team. Another DHS team, with Kerri Horvath, Paige Krull, Nora Schweitz and Bailey Younger, finished second place, only 1.5 points behind the first-place team. Ericka Max, mother of sophomore Alex, said the "A" team is well prepared to take on the other 25 teams expected to compete in the state tournament. "Our team looks like they've got a good shot at first," she said. Last year's team took fourth place in the state tournament. A team from Vail is expected to provide stiff competition. "Our team this year is feeling pretty good about having a shot at beating them," Max said. If the DHS students win the state tournament, they move on to the national competition in San Diego in April. About 63 students take Francis' popular cooking classes. "The idea is that students get an idea of whether they want to go into a hospitality career," she said. Students take field trips to hotels and restaurants to see how they are run. Francis said that even if students do not go into the hospitality industry, they learn skills that will benefit them later. "At least kids leave feeling comfortable trying to cook at home," she said.